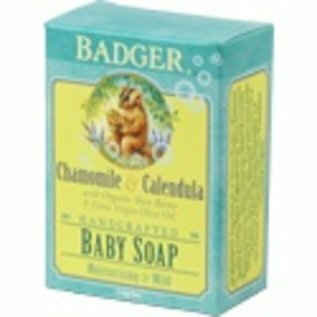 Badger baby soap is moisturizing and non-irritating, with dreamy lather and fabulous essential oil fragrances that are exceptionally good for your skin. Moisturizing, non-irritating and soothing for skin – non-drying baby soap. Moisturizing & Mild Baby Soap. Badger baby soap is moisturizing and non-irritating, with dreamy lather and fabulous essential oil fragrances that are exceptionally good for your skin. Our handmade soaps are made from all natural and organic ingredients. This gentle Baby Soap begins as certified organic plant oils and through the process of saponification, a simple, handcrafted "true soap" is created. Chamomile and Calendula help to calm and relax your baby, saponified oils of Extra Virgin Olive and Coconut gently cleanse, and Shea Butter moisturizes and soothes delicate skin. This soap is also great for those with sensitive skin. We would never add any detergents, foaming agents, artificial "fragrance" or color, synthetic or harsh ingredients - just good clean soap! Baby Soap Ingredients: Aqua (Purified Water), *Cocos Nucifera (Coconut) Oil, *Olea Europaea (Extra Virgin Olive) Oil, *Elaeis Guineensis (Palm) Fruit Oil, *Elaeis Guineensis (Palm) Kernel Oil, **Sodium Hydroxide (Lye), *Ricinus Communis (Castor) Oil, *Cera Alba (Beeswax), *Mel (Honey), *Butyrospermum Parkii (Shea) Butter, Essential Oil of *Anthemis Nobilis (Roman Chamomile), and CO2 Extract of *Calendula Officinalis (Calendula).